Mato Grosso, Brazil is now one of the most intensively farmed places on the planet. Thirty years ago, the region was covered by native grasslands which gradually transitioned into forest. Now, soybeans and corn stretch as far as the eye can see. Forest remains, though, many of the city -sized farms that cover the landscape have 50% of their land still forested. The result is perhaps the most incongruous landscape I have ever encountered. Tapirs, giant anteaters and jaguars walk through miles of soy between forest patches. Macaws squawk loudly in areas planted with rubber trees. Rheas, native to the savannah landscape further south, have followed the clearing northward and now feed in the soy fields. All the while crop dusters spray pesticides across the fields, and house-sized combines harvest mile after mile of soy. 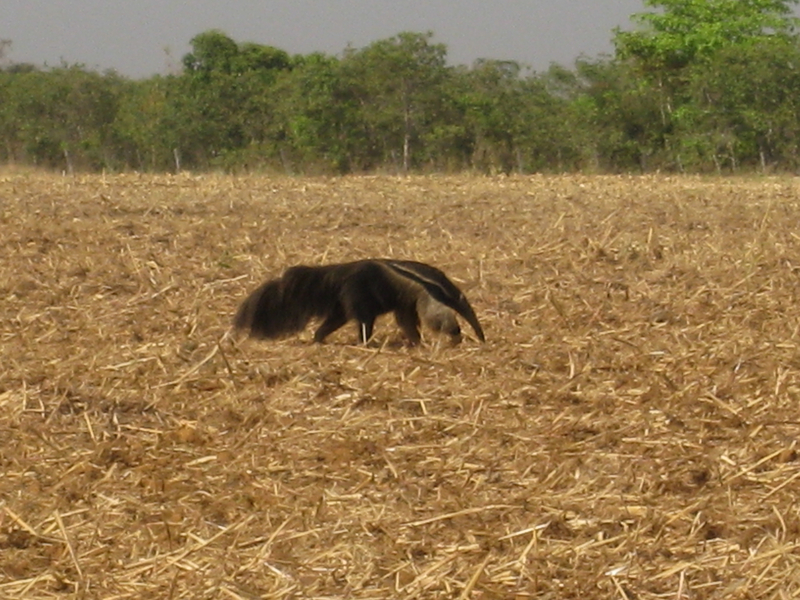 A giant anteater meanders through a field – native forest in the background. The lab started working in this region when Chris Neill and I co-advised Shelby Riskin (nee Hayhoe) for her dissertation project, which explored the impacts of this new way of farming on water and soil. What she found was eye-opening. The water draining these heavily fertilized fields was clean – not at all what we would expect from a mid-western US view of industrial agriculture. The deep soils were acting as an effective filter. But the teleconnections of agriculture were also apparent. These farms could not exist without massive applications of phosphorus fertilizer. While Brazil is ramping up production on some of the most P poor soils in the world, it does not have a lot of P deposits. Those reside mostly in Morocco, China, and the US. Nor do the soybeans in Brazil stay in Brazil, most are shipped to China to feed an increasingly animals in an meat-eating society. So what are we doing now? Chelsea Nagy is trying to understand the fate of the forests left behind in this increasingly agricultural landscape. I’ve been thinking about what can learn from this farming system for the sustainability of global agriculture. It’s relatively new to me, but it’s a fascinating topic with a lot of room to explore.